Home » How to do a simple but effective Cookie Audit. How to do a simple but effective Cookie Audit. With the new EU Cookie Law coming into full effect in May 2012 you need to be finding out what cookies your site sets and planning for how you’ll handle these. But how do you find out what cookies your site sets? You might just ask the developers but the chances are that they won’t know. This is because large sites grow over time and often sites use third party components and services which set cookies. My approach is is to use Firefox and the developers toolbar. 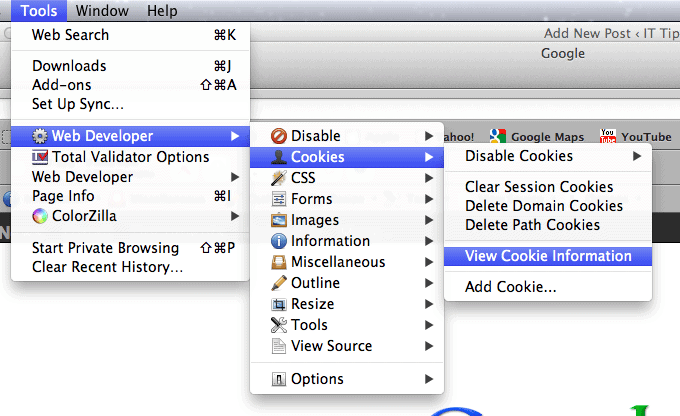 At the start of the session use the Clear Session Cookies, Delete Domain Cookies and Delete Path Cookies options to give yourself a completely clean browser. You can check this then by using the View Cookie Information option. The screen should display that you have zero cookies. These are both session cookies an expire almost immediately so are acceptable under the new law without any further changes. You need to look out for cookies with long expiry periods and in particular those being set by third party tracking systems. It was specifically those cookies that the law was designed to require user content for. How many weeks left in the financial year?